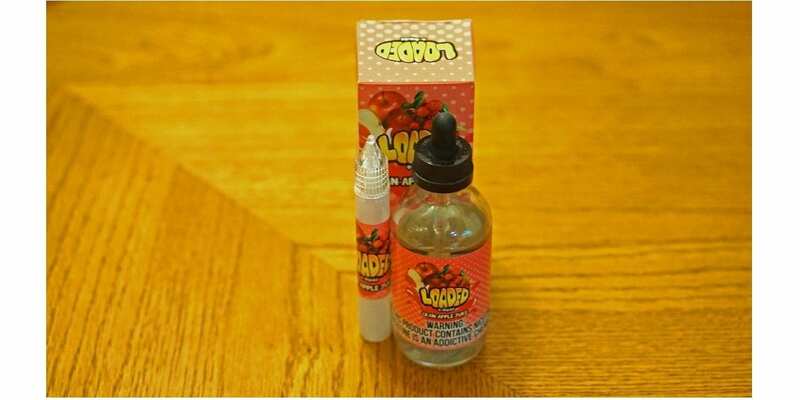 Loaded Cran-Apple Review - Daily Vaping Deals & The Best Vape Product Reviews at Vaping Cheap! Loaded e-liquid have become extremely popular due to their great tasting e-liquid at affordable prices. Loaded Cran-Apple is the newest flavor to be added to their line which also includes Glazed Donuts and Smores. This new flavor is completely different than the previous since it’s more of a fruit/drink flavor while the other two were dessert/bakery flavors. This e-juice is only available in a large 120ml glass bottle, and the nicotine strengths available are 0mg, 3mg, and 6mg. In addition, Loaded Cran-Apple has a VG/PG ratio of 70VG/30PG, which is a great ratio for both tanks and drippers alike! Before getting any further, I would like to thank Fuggin Vapor for sending me this e-juice for the purposes of this review! I will give you my overall thoughts about Loaded Cran-Apple, and conclude with whether or not I recommend this flavor! Remember, taste is subjective so what I may like you may not like and what you like I may not like. Next, I will go over the specific atomizers and mods used to test this e-juice. Click Here to Check Out Loaded Cran-Apple! Flavor Description: Cranberry Apple Juice E Liquid by Loaded is sweet apples and cranberries blended together for a refreshing cranberry and apple juice drink! Firstly, I will start by saying this is an excellent addition to the Loaded E-Liquid Line by Ruthless. I haven’t tried many cranberry flavors much, and the ones I have tried have been just okay. In addition, I’m not the biggest fan of apple flavors either. However, the mixture of cranberry and apple is a home run with this e-liquid! On the inhale, you get a nice mixture of apple and cranberry, neither flavor overpowers one another. The apple flavor is very fresh and authentic tasting, and the vape experience overall with this e-juice is simply refreshing. On the exhale is where this flavor kind of caught me off guard as I was not expecting the slight cooling effect on the tail end. At the very beginning of the exhale, you get the same flavor notes as on the inhale, but is finished with a very light cooling sensation. The cooling effect is not overwhelming nor overpowering, which is perfect as this really does help replicate what this flavor was going after. Also, Loaded Cran-Apple vapes great in both tanks and drippers, which is a huge pro! Honestly, I wasn’t exactly sure what to expect when first receiving this flavor, but I can easily say this is an all day vape. Loaded Cran-Apple is very refreshing, and the throat hit is very smooth with no burning or stinging. The cooling effect was surprising at first, but it grew on me after a few vapes, and I’m happy they added it. All in all, this is an excellent flavor, and another home run by Ruthless! If you’re looking for a nice refreshing vape, and a fan of cranberry and fresh apple flavors, then this is an e-juice I highly recommend! So my morning juice is minute maid cran-apple, then I heard that there was a juice out there called Loaded cranberry apple from the makers of Ruthless (they make grape drank the best vape juice on this planet) I said I have to get this and try it. Well I’m in love great balance of cranberry and apple, the other awesome thing that ruthless did the didn’t put a green apple candy flavor it’s a red fresh apple flavor ohhhh so sweet then the hit of the tartness of the cranberry balances it out. Every time I look at it I feel like Homer Simpson (from “The Simpsons”) when he talks about A donut or a sandwich or food he loves then starts frothing at the mouth. Please if you like Minute Maid Cran-apple try this e-juice, it’s not that expensive.